As Justin Chapple showed us in this week's installment of Mad Genius Tips, an empty plastic water bottle makes easy, quick work of separating eggs. Here's what to make with them. As F&W Test Kitchen whiz Justin Chapple showed us in this week's video installment of Mad Genius Tips, an empty plastic water bottle makes easy, quick work of separating eggs. Now that you have the power to generate stockpiles of whites and yolks, here's what to make with them. Béarnaise Sauce: Classic creamy béarnaise sauce is a steakhouse staple (and it's also terrific on salmon). Avgolemono Chicken Soup: Avgolemono is a classic sauce of chicken broth, egg yolks and lemon juice. To make it a more substantial dish, just add rice and shredded chicken. Garlicky Caesar Salad: This authentic Caesar salad from chef Terrance Brennan of Terrance Brennan's Seafood and Chop House in New York City, gets a flavor wallop from large doses of chopped garlic and anchovies. Chocolate Custard: This super silky custard requires no baking; simply chill to set. French-Style Ice Cream: This traditional ice cream has an egg-rich custard base. Christina Spittler of Seattle ice creamery Molly Moon's says the egg yolks help make a denser ice cream. Egg White & Spinach Frittata: Alex Stupak created this light, airy egg white frittata because he wanted to offer a brunch dish at Empellón Cocina that was healthy yet still delicious. Coconut Macaroons: These sweet and chewy macaroons have only five ingredients: shredded coconut, condensed milk, vanilla extract, salt and egg whites. Almond-Pistachio Nougat: Soft, nutty nougat is fantastic on its own but also great baked into croissants. Angel Food Cake: Katie Lee's grandmother won multiple blue ribbons (and a KitchenAid stand mixer) with this ethereal cake. The mixer came in handy the next time she made it—whipping 16 egg whites by hand is quite tiring. Raspberry Macarons: These vibrant, jam-filled macarons are terrifically simple to make. 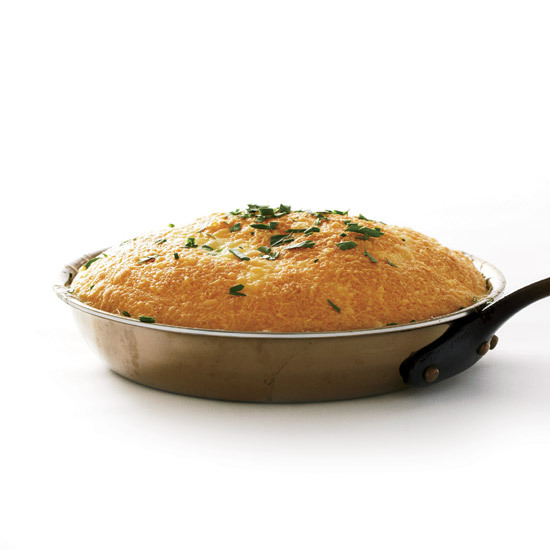 Corn Pudding: Some corn puddings are really dense, but this one is perfectly moist and light thanks to the egg whites. Omelet Soufflé: This fluffy omelet was perfected by food geniuses Aki Kamozawa and H. Alexander Talbot, of the food science blog ideasinfood.com. Rothschild Soufflé: "The base for a sweet soufflé is traditionally pastry cream," says Jacques Pépin. He substitutes béchamel for this version—it's "basically the same thing, but easier." Sacher Torte: Sacher torte is a classic Austrian chocolate cake layered with apricot preserves. Lidia Bastianich’s version uses the preserves three ways: for moistening the cake layers, as a thick filling between the layers and as a glaze to seal the cake before covering it in chocolate. Banana Waffles: These delicious waffles are extra crisp thanks to a sizable amour of butter in the batter. Homemade Yodels: These homemade Yodels (a.k.a. Ho Hos) are made with thin sheets of spongy chocolate cake layered with tangy, sour cream-spiked caramel whipped cream.